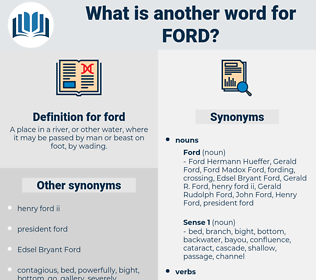 What is another word for ford? A place in a river, or other water, where it may be passed by man or beast on foot, by wading. assist, divide, disconnect, disjoin, abet, aid, separate, part, help, unmix, stay, remain. concentrate, condense, shorten, compress, Unlink. 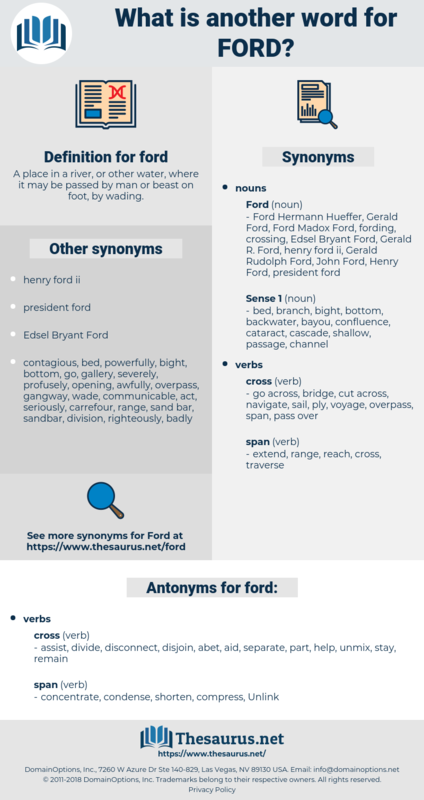 idle, ignore, avoid, dodge, finish, neglect, be lazy, conclude, stop, end, laze. She would ride up the canyon to the ford and wait there, she said to herself. He didn't want Mr. Ford to make time. cut across, traverse, get across, track, get over, cross, cover, pass over, cut through.